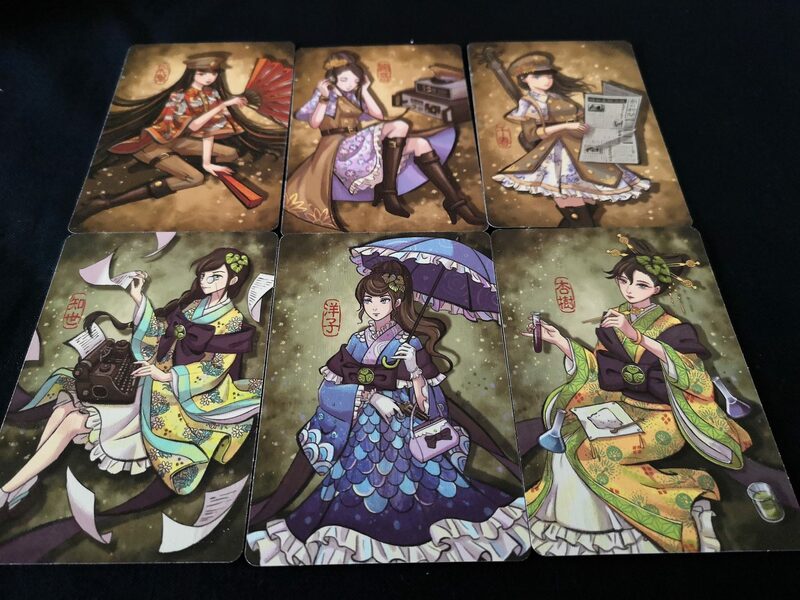 I’m not going to lie – I bought Shadows in Kyoto purely for the art and the link it had to the rich mythology of the Hanamikoji franchise. I knew nothing else about it – it just appeared as an otherwise undistinguished entry in a ‘new stock coming soon’ list on a board game website. It turns out though Maisherly Chan can sell me a game purely on the basis of her association with its aesthetics. I guess that’s something I learned about myself – that I’m only one artist away from falling into the anime fanboy rabbit-hole with no hope of escaping. That’s not something I expected at my age, but you can’t argue with the facts. Luckily there’s an interesting game in here too. It’s a kind of Stratego variant where feints and spy-craft are used to induce your opponent into making the critical mistakes you need them to make while you engineer the circumstances under which you can avoid the same. 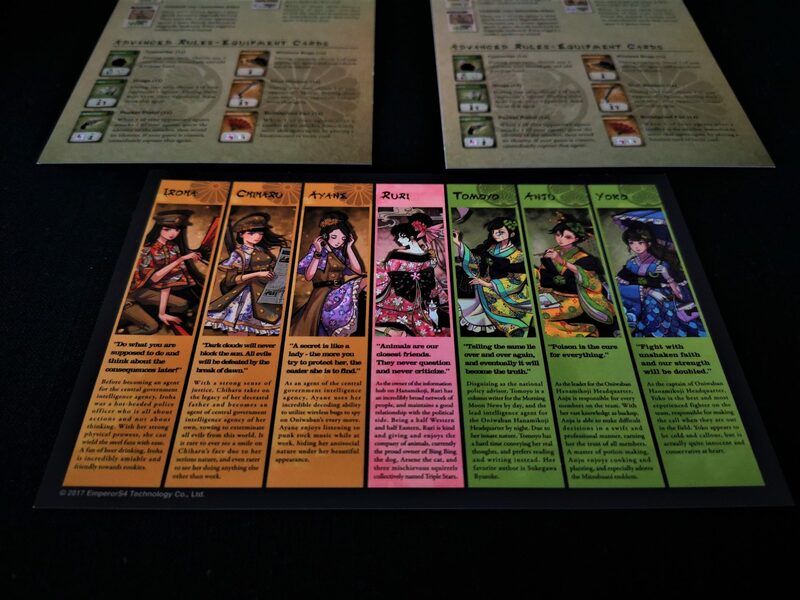 Each player controls a small collection of six geisha. One player is in charge of the Oniwaban – a secret cabal of spies and resistance fighters. The other controls the commanders of the Meiji government. Each side has a small pool of unique powers and leaders available, but they’re both attempting the same thing – to sweep the district of Hanamikoji clean of their beleaguered opponents. Thankfully, the card art here is typically beautiful and didn’t play me for a chump. 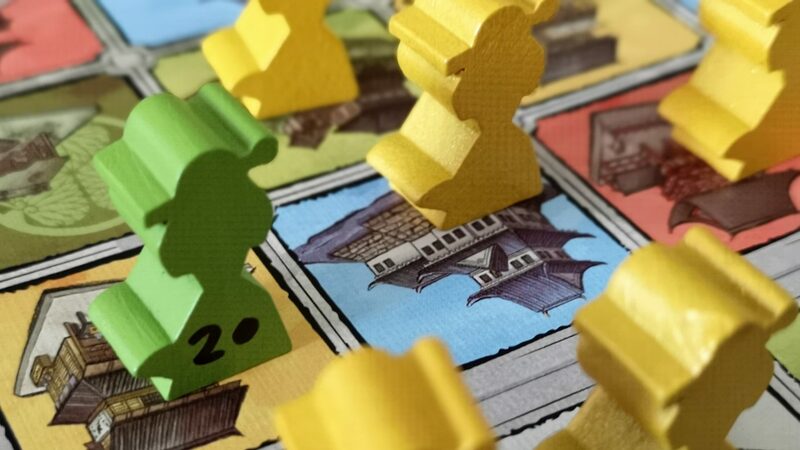 I’ve long said that it’s a massive wasted opportunity that board-game publishers don’t offer prints of the especially lovely art that decorates the cards and boards of their games. I’d happily hang pretty much anything by Maisherly Chan on any wall in my house. The depictions of the factional leaders available to players here are no exception. 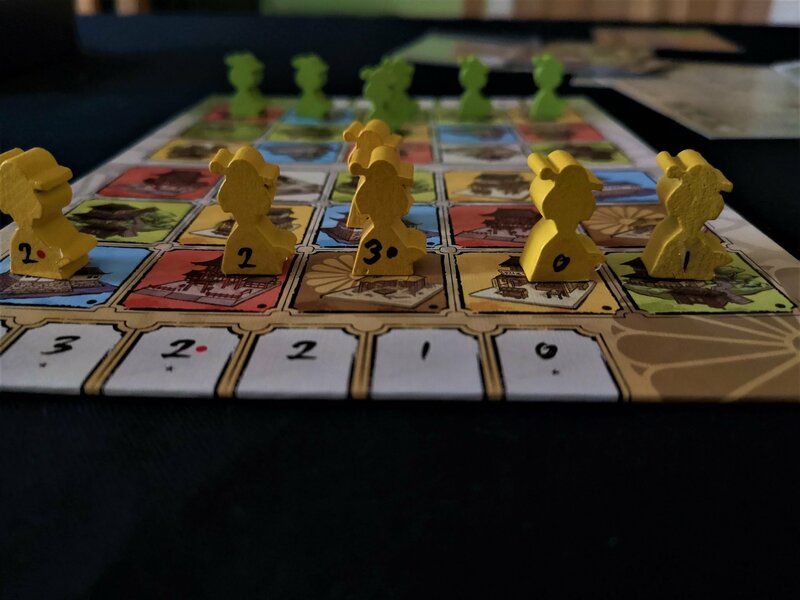 Unfortunately, while this part of the game is lovely it’s not carried through to the rest of the box – the board itself has heavy overtones of home décor in the 70s. It’s drab while being colourful, like a sad pack of party balloons from a 99p shop. It’s an uncomfortable state of affairs – you spend most of your time looking at the board, and yet the genuinely beautiful artistry is hidden away on cards you rarely reference. The components that are most critical to the game just replicate the sad, listless iconography of the board. 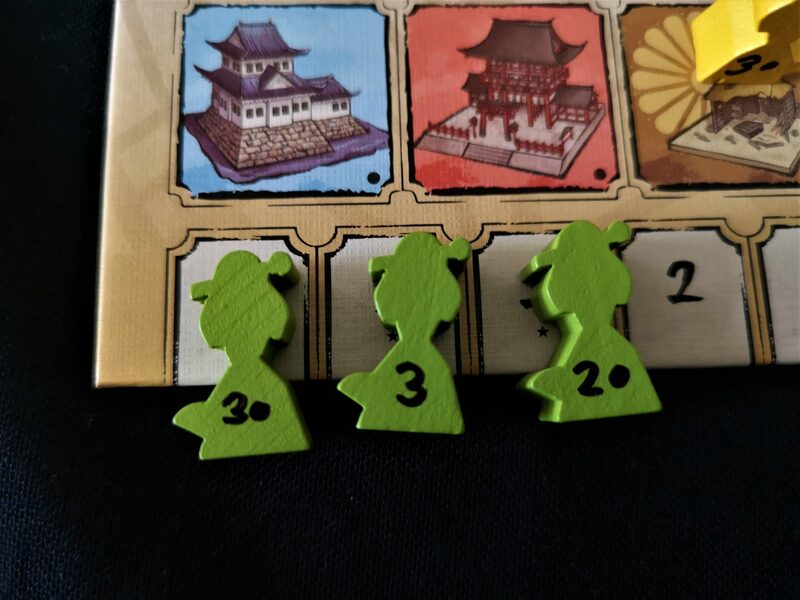 It’s that board where the game is to be found – you place your little geisha meeples around the starting locations of your district, and your opponent does the same. You end up with two massed ranks of agents, the status of each one obscured from the other side. You then take turns to move individual pieces inexorably forward as you play a game of cat and mouse where no-one is ever sure if they are predator or prey. 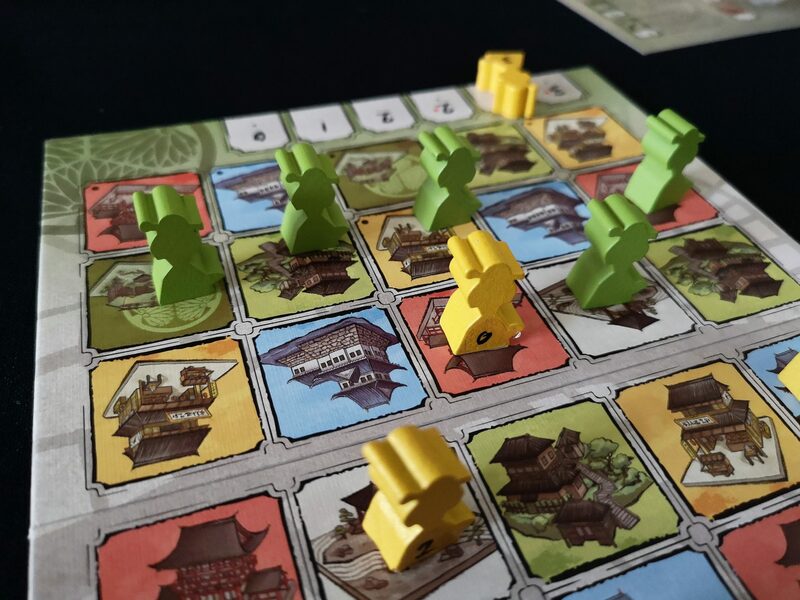 Each of your meeples has a value associated, and two meeples also have coloured dots that indicate they hold true, actionable intelligence for your opponent. The winner of the game is the one that captures both pieces of enemy intel. However, if they capture three agents with false information they lose instantly. Both players also have an additional win condition – to get an agent with true intelligence to farthest point of the board. The problem, as you’ve probably guessed, is that the only person that knows the value of each agent is the person that controls them. Those numbers are only on the back of each piece unless somehow revealed through the course of the game. Movement for each piece is based on a hand of cards possessed by each player, and these determine the where on the board to which pieces can move. Most of these are coloured location cards permitting only movement one space forward for one agent. Some are more complex and nuanced tactics cards that permit for pieces to move more rapidly and in unconventional ways. A couple even set traps that limit the movement opportunities of opponents. 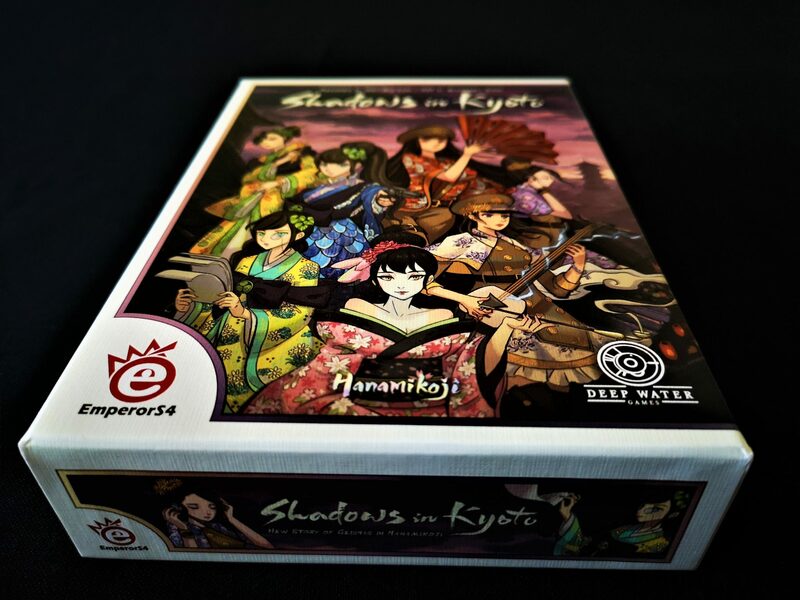 Aside from a few fripperies such as special one-use powers, that’s the entire structure of Shadows in Kyoto – move pieces, try to get your opponent to capture your decoys while you attempt to grab the real intelligence floating around the board. In both cases, try to get your true agents to the farthest part of the district so as to trigger a win. It’s not hugely complicated but it’s full of a kind of deductive and inductive complexity that is involving and engaging – up to a point. The whole game works essentially on a kind of negotiated risk that plays into the Vizzini ‘I clearly cannot drink the wine in front of me’ style of bluff and counterbluff. The game isn’t in the movement of pieces, not really – it’s in the clues contained within that movement. It’s in the way you read meaning into the scenario when someone takes an otherwise undistinguished agent and moves it into the grasp of several of your own. These are the points when the game attains its most engaging moments – when it asks you for clarity of action in fundamentally unclear circumstances. More than this though, these actions have reverberations – it’s not just about what your opponent did, but what you do and what they do in response to what you do. Every move is a gambit, every countermove a gamble. All you have to go on is an unadorned, unidentified piece and the pattern of movement to which a player has ascribed it. It could mean anything and the cost of mistakes is considerable. There are only six agents for each player, and the win conditions swing wildly. You don’t just lose a couple of points here. Capture two agents with real intelligence and you win – that agent you capture might take you 50% of the way to victory. On the other hand, capture an agent with false intelligence and you’re 33% of the way towards losing. These are big, stark numbers and as you might imagine they weigh heavily on your decision making. 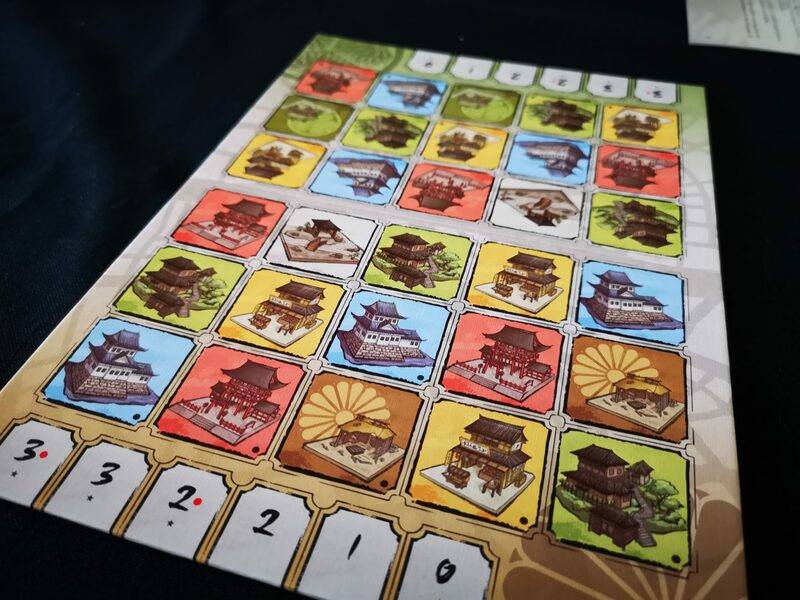 To its credit, Shadows in Kyoto does realise this and introduces a few quirks that can genuinely force actionable information into the game. The problem there is that this upsets the fragility of the uncertainty space and as a consequence they feel hugely overpowered until the flow of play routes around the damage they do. Iroha is an example of this – each of the commander cards gives a variable player power, and hers is ‘when an opponent attacks one of your agents, reveal the attacker’s identity as well’. That pulls so much information into the game, and with such asymmetrical impact, that it distorts everything around it. People play differently – the player lacking her power becomes very predictable in their aggressive and risky movements and the opponent does everything they can to avoid attacking at all. The end result is that you have the same lack of certainty, but the Ihora player is just forced to take the initiative more often. That becomes the basis of the next never-ending spiral of doubt and doubts about the doubts. The uncertainty will always find a way to manifest itself until it’s too late for anyone to change the course of the game. Whether this works at all is going to depend then on the intangible – the information content you feel that you can wring out of the twitches and gestures and intentions of your opponent. There are those that believe they can read every lie writ large across someone’s face. There are people that believe you can tell the content of someone’s character by the firmness of their handshake. Maybe they can. I’m an emotionless android in an ill-fitting muppet suit. I’m not the best person to pontificate on the gaming benefits that come with a high emotional intelligence. Nonetheless, I’m sceptical that the bandwidth of a human face provides any additional insight into game state that isn’t itself thoroughly tainted by uncertainty. It’s an odd game then – it manages to evoke some of the animalistic angst of Hanamikoji (the game, as opposed to the street) by presenting you with impossible decisions with unconscionable consequences. It’s a far less competent execution of the idea though because the difficulty of the decision is, in the end, illusory. It doesn’t become more real as a result of the difficulty of analysis. It’s like Bitcoin – just because it took a lot of processing power to generate it doesn’t mean anyone is going to let you buy groceries with the result. It feels less like a game and more like the kind of stylised systemic playground people might use to explore principles of game theory. It’s like a spatially complex version of the Prisoner’s Dilemma. In the absence of useful tools that we can use to tame a system, the best we can do is understand what our behaviour in the face of uncertainty says about us. 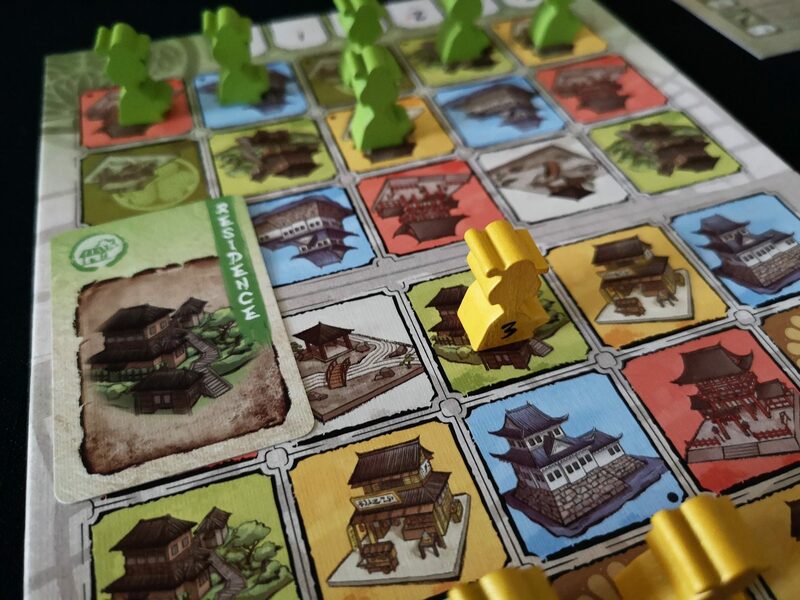 I might recommend Shadows in Kyoto to someone looking to train an AI about optimal decision making in uncertain circumstances, but I wouldn’t really recommend it to the presumably human person reading this post.